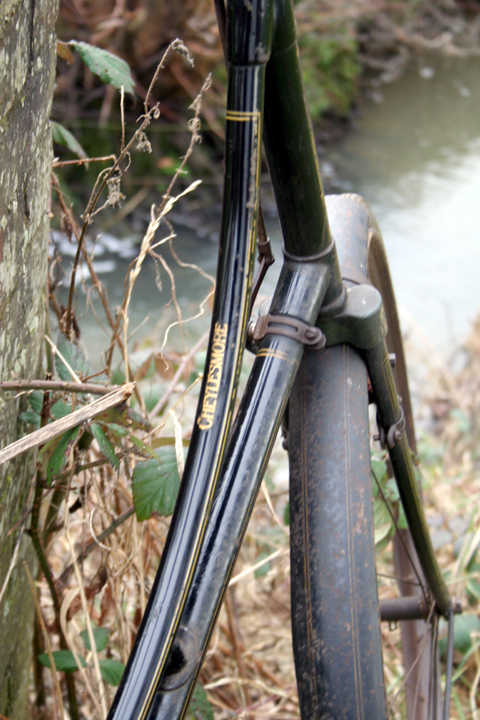 …………………………..For being unable to present a photograph of Mr. Barden. 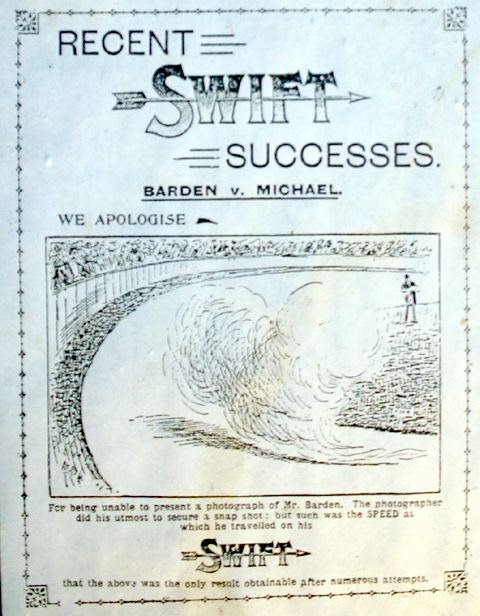 The photographer did his utmost to secure a snap shot: but such was the SPEED at which he travelled on his SWIFT that the above was the only result obtainable after numerous attempts. 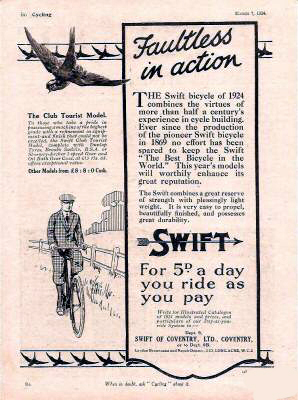 This Swift Ladies Model was made by Swift while they were still at their Cheylesmore, Coventry factory (which closed in 1931). 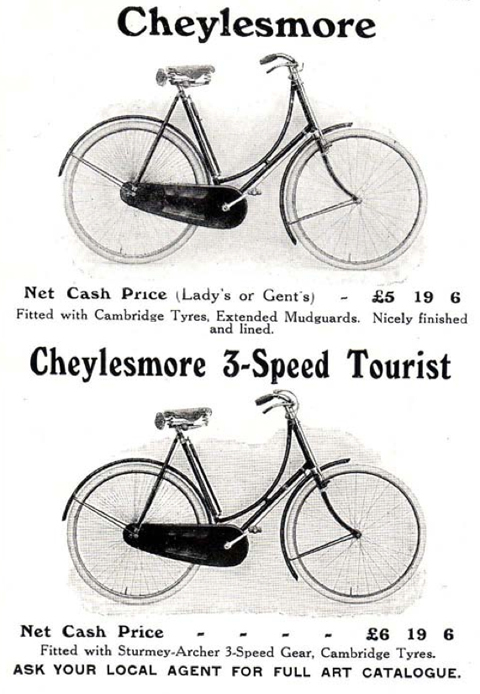 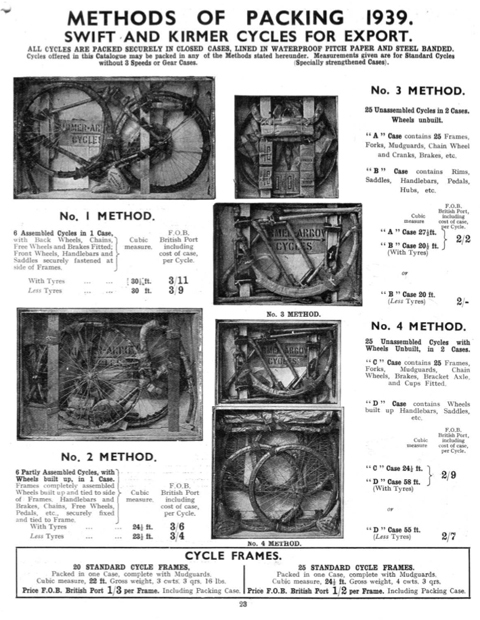 Compare the Cheylesmore illustrated in the 1915 Swift catalogue, below. 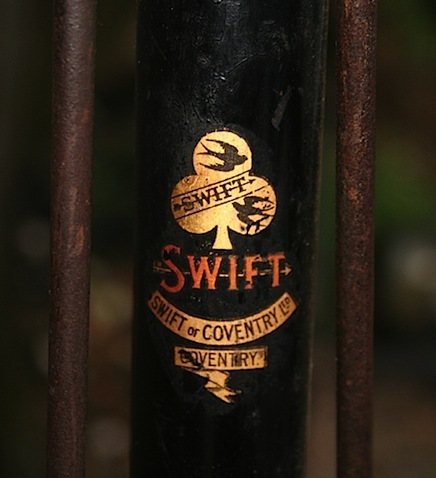 Swift adopted the title ‘Swift of Coventry’ in 1919. 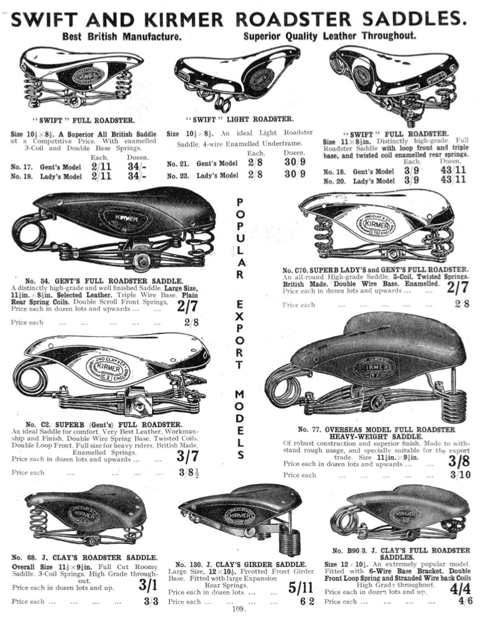 In 1898 they produced their first motor cycle and a motor tricycle. 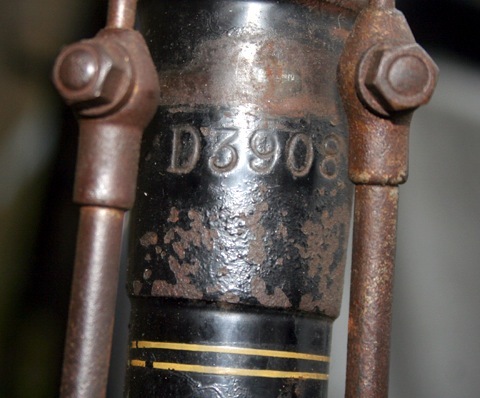 The first prototype car was made in 1900 which went into production in1901. 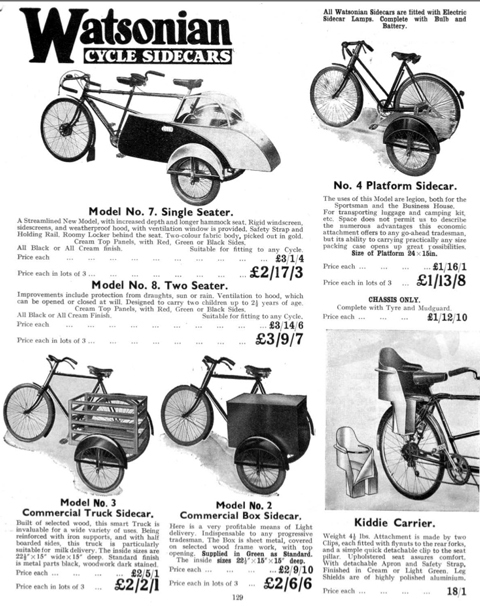 It had a tubular chassis, a single cylinder de Dion engine and a two-speed back axle. 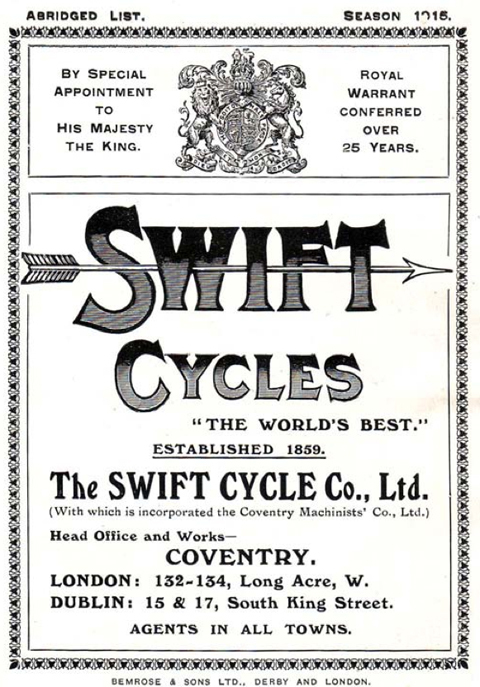 The Swift Motor Co. was formed in 1902 and produced one, two, three and four-cylinder cars, first using proprietary engines up to about 1907 and then those designed by their Works Engineer, William Radford, which were made in their own factory. 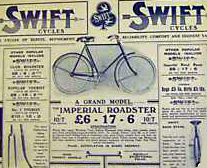 During the early 1900’s Swift entered their cars in reliability trials and won many gold medals. 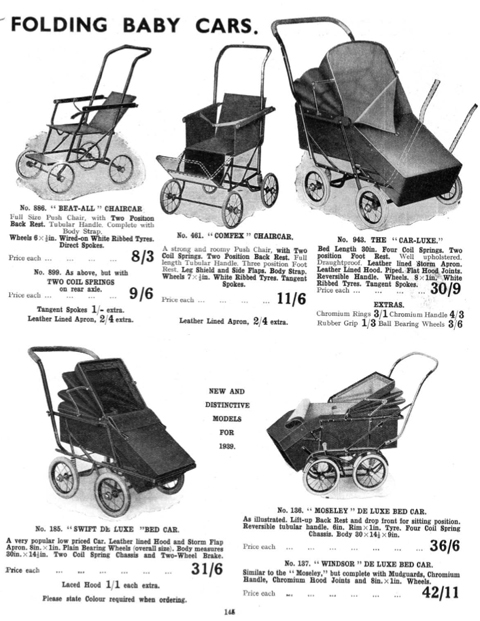 Up to 1915 several models were produced each year. 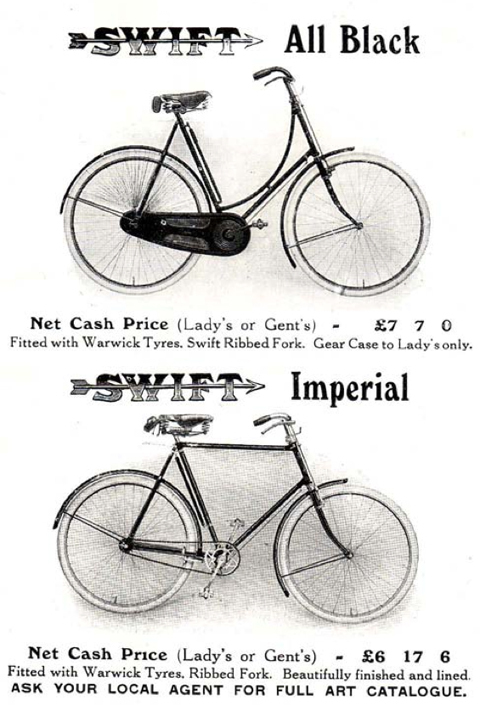 During the First World War the factory produced munitions, Renault and Hispano-Suiza aircraft engines, military bicycles and other war equipment. 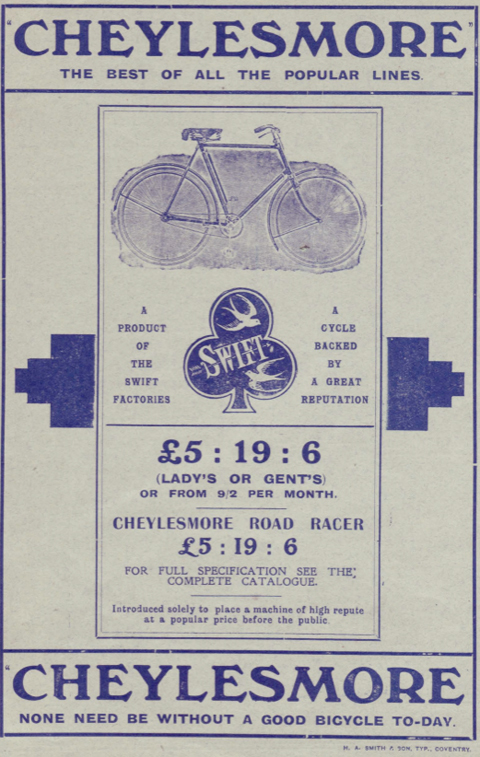 In 1919 the Company joined the ill-fated Harper-Bean organisation and changed its name to Swift of Coventry Ltd. Production was then concentrated on the four-cylinder 10hp and 12hp models which were renowned for their reliability. 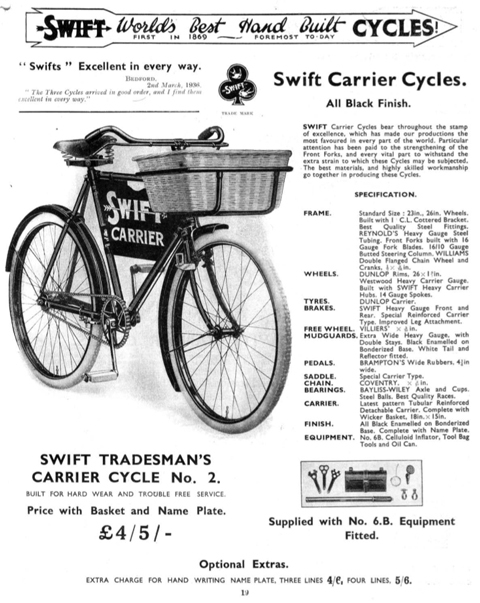 Although Swifts had their faithful followers, by the late 1920’s their hand-built cars could not compete with the mass-production methods of Morris, Austin, and Ford, whose similar cars sold for only half the price of Swifts. 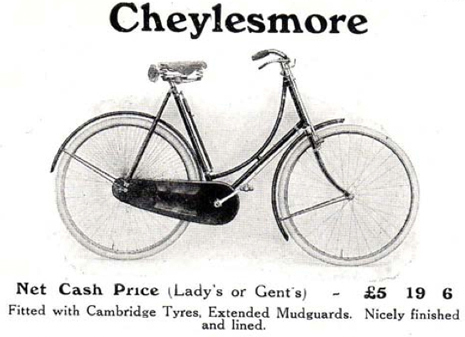 In spite of producing a cheaper 8hp model, the Cadet, with a Coventry Climax engine and a centre-change three-speed gear box in late 1930, this was insufficient to save the Company and the factory closed its doors for the last time in April 1931. 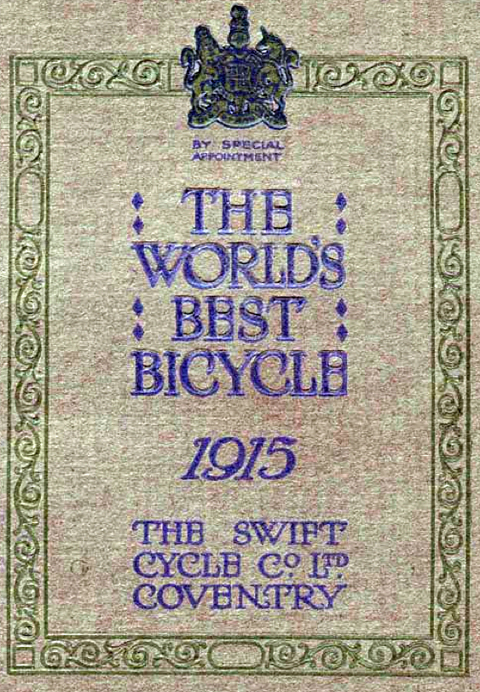 Below you can see the front cover of the 1914 Swift catalogue. 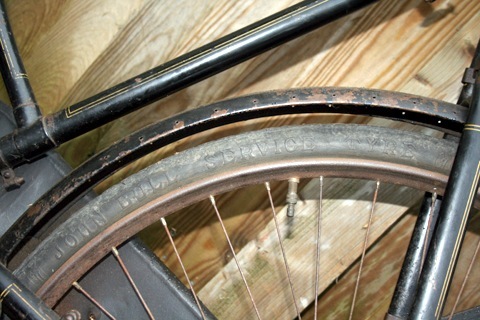 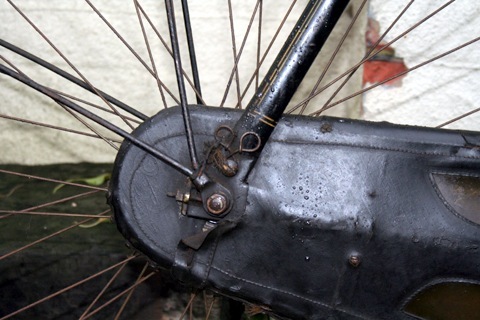 An interesting feature of this bicycle is the leather and celluloid chaincase. 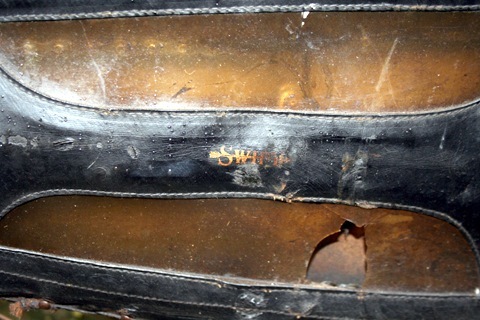 You can still see the name ‘Swift’ in its centre. 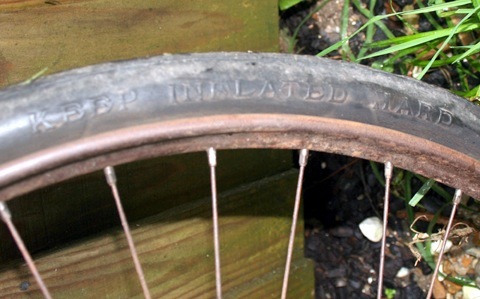 According to the inscription, the rear tyre is an original ‘John Bull Service Tyre.’ I’m not sure if it still contains 1919 air. 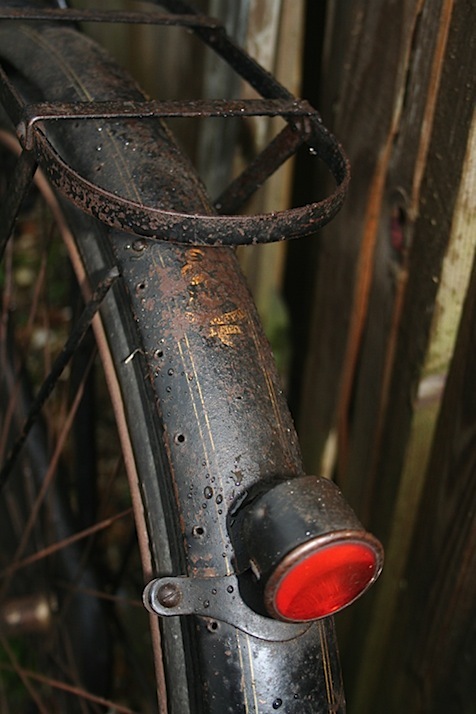 The pretty little Lucas rear light is a period accessory. 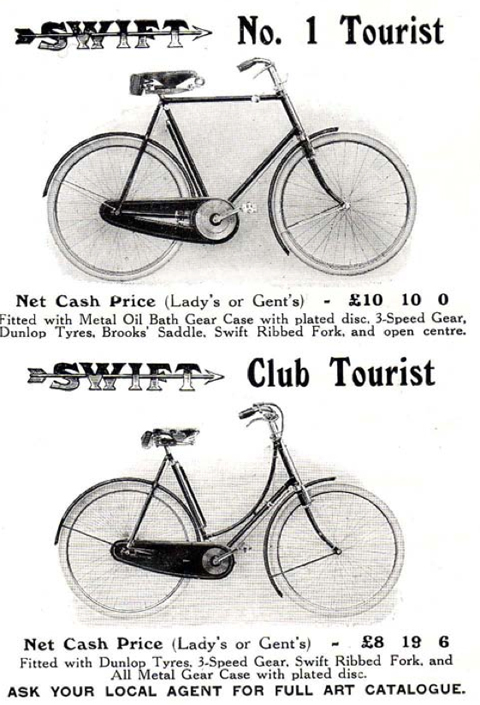 The names of established bicycle manufacturing companies were a saleable commodity. 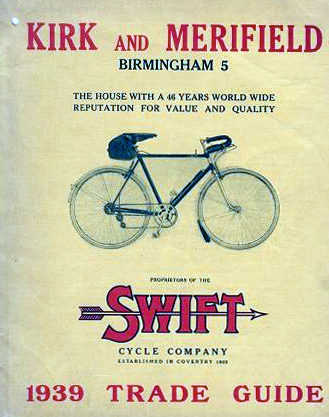 In this case they provided added prestige to the cycle components company Kirk & Merrifield, who bought Swift in 1933. 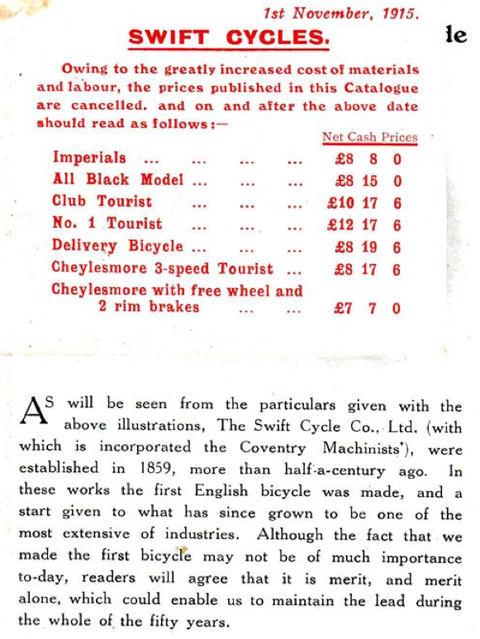 Below you can see their interesting trade catalogue for 1939. 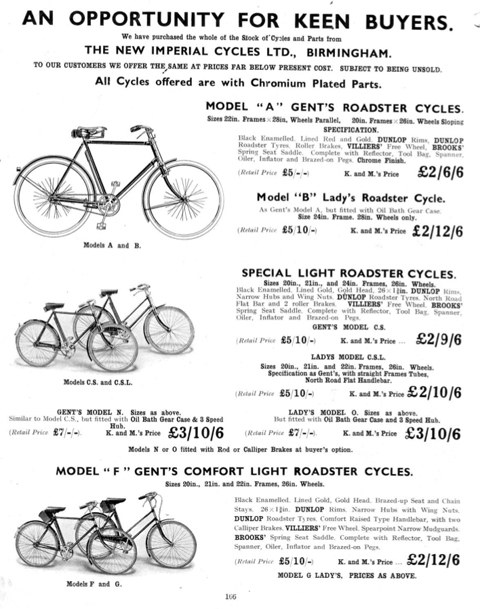 Bear in mind that the main business for cycle component companies such as Kirk & Merrifield was in the export market. 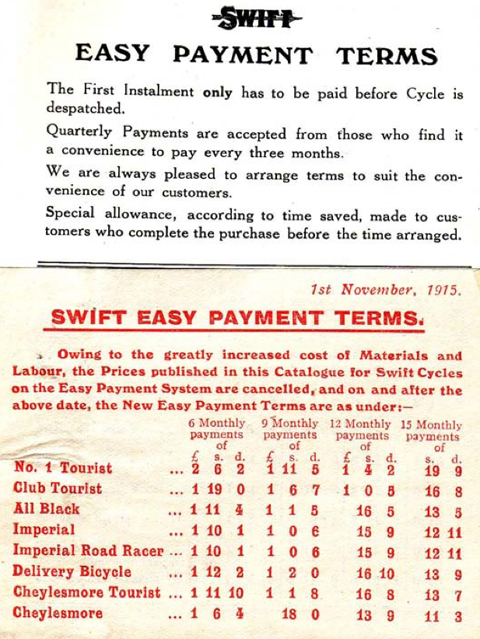 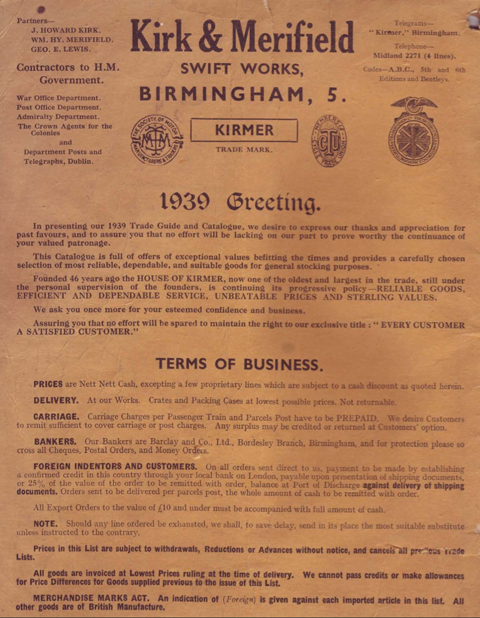 Transfers such as these would have been mainly posted to Commonwealth countries, where bicycles were exported in knock-down form. 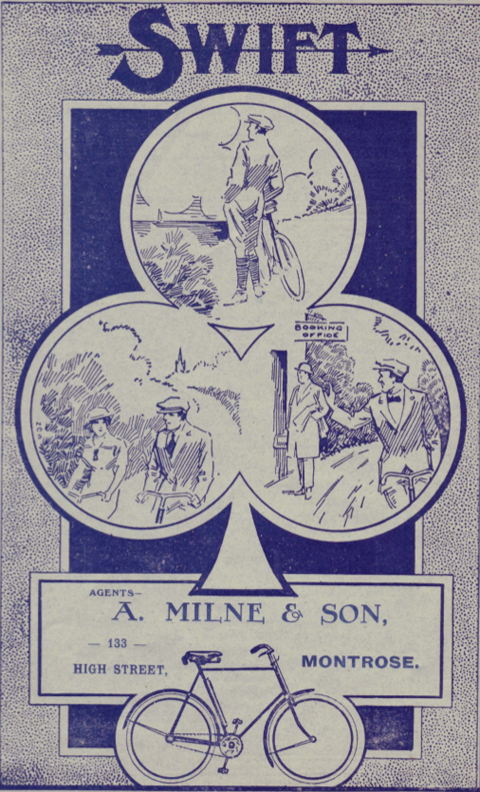 The bicycles illustrated in the packing descriptions below bear Kirmer badges, which was Kirk & Merrifield’s ‘house’ brand. 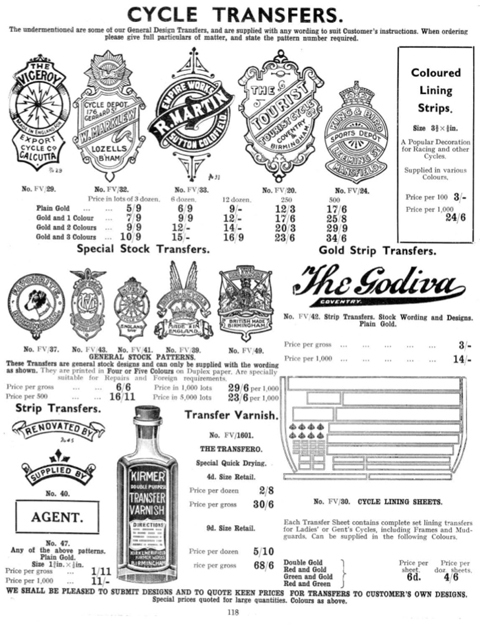 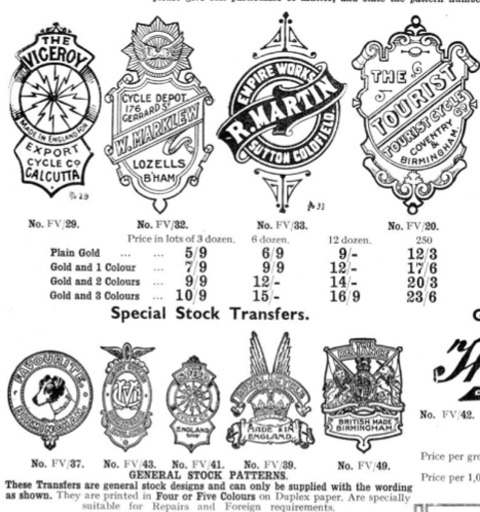 Like many retailers, bicycles with their own badges would have been supplied by various wholesale cycle manufacturers. 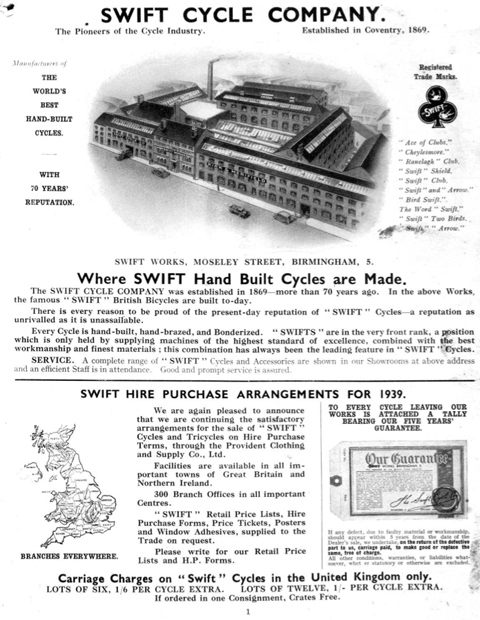 After taking over the company, they may have made them in the Swift factory, though it’s likely that they could buy in finished bicycles cheaper from suppliers than making them themselves. 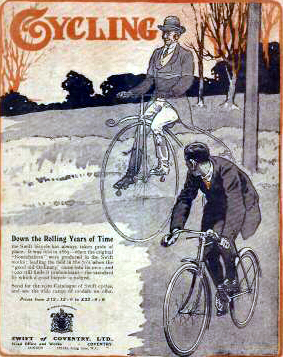 Hercules was a major bicycle supplier to the trade. 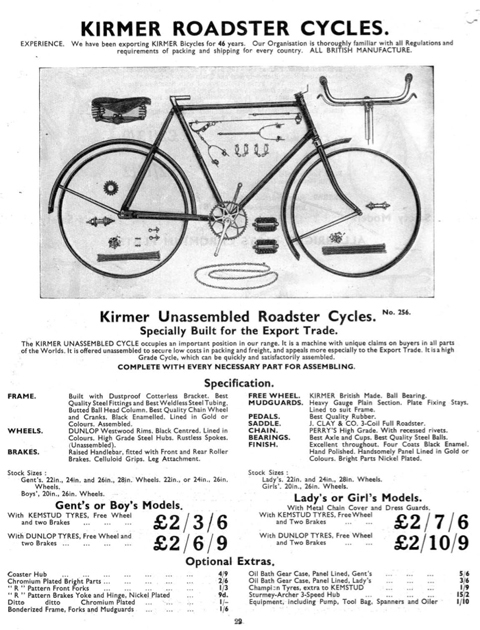 But I’ve noticed various Phillips components in the K & M catalogue, so I suspect that Kirmer bicycles may have been Phillips machines. 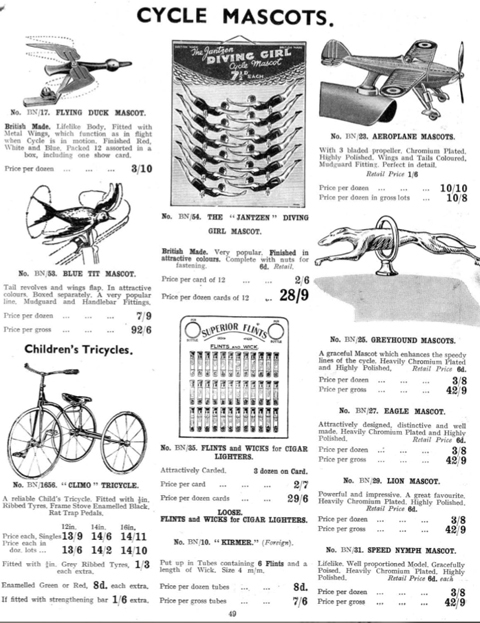 You could buy a bicycle in various stages of assembly. 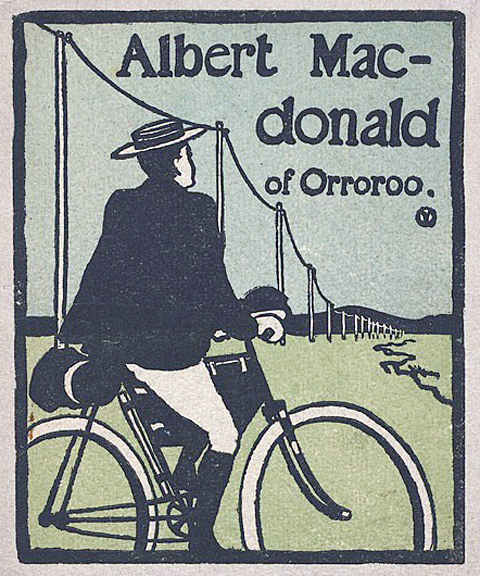 I’m always amused by pre-war bicycle mascots. 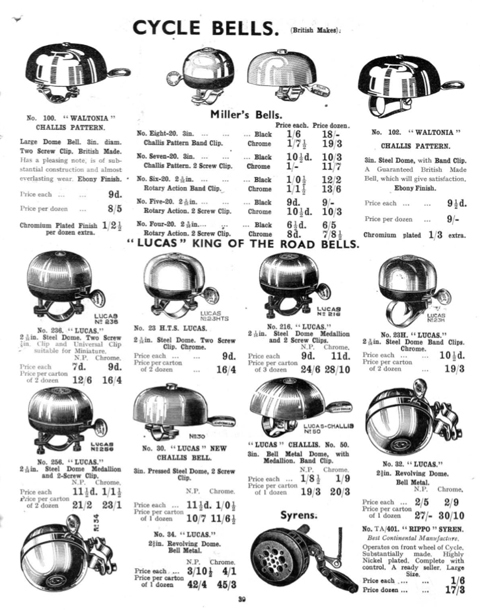 Kirk & Merrifield illustrate a comprehensive range. 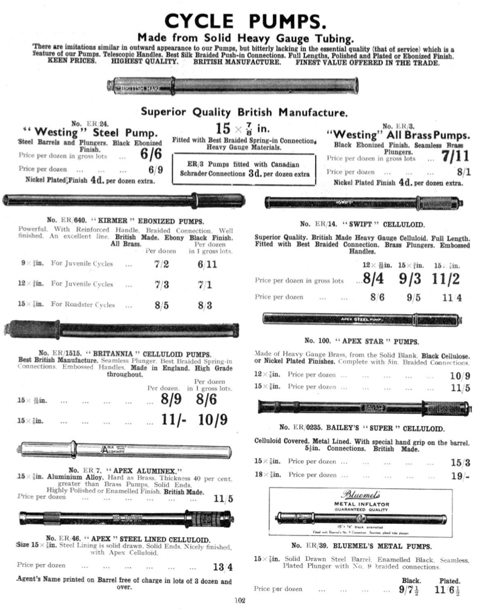 Among the pumps shown below is a SWIFT celluloid. 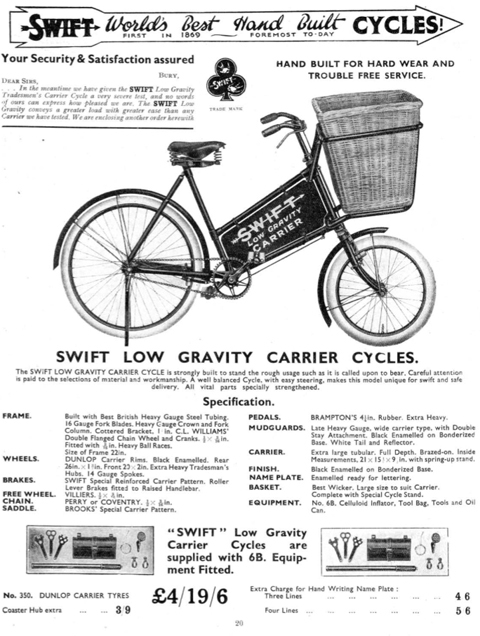 Like bicycles, pumps also were supplied to retailers ready for them to add their own names. 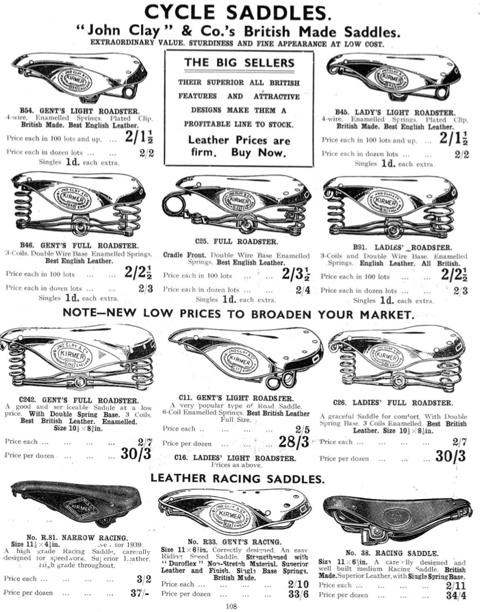 Both Swift and Kirmer saddles were made by John Clay & Co. 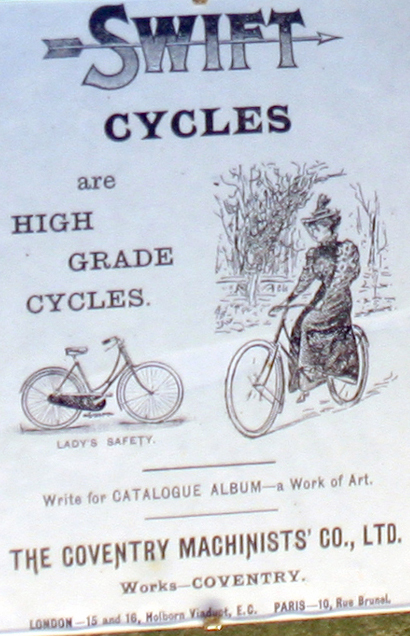 There were two types of trade bike advertised. 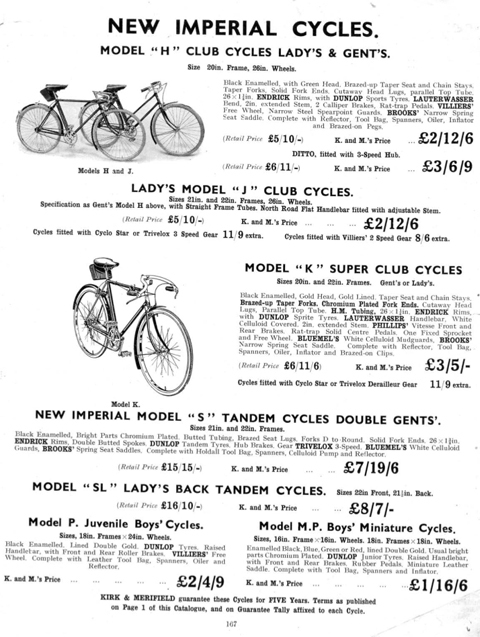 Kirk & Merrifield also bought the remaining stock of New Imperial Cycles Ltd when that company closed. 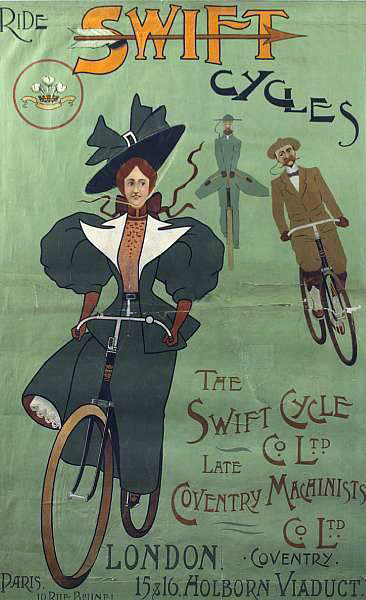 Finally, below you can see a woodcut from 1898, illustrating a Swift bicycle. 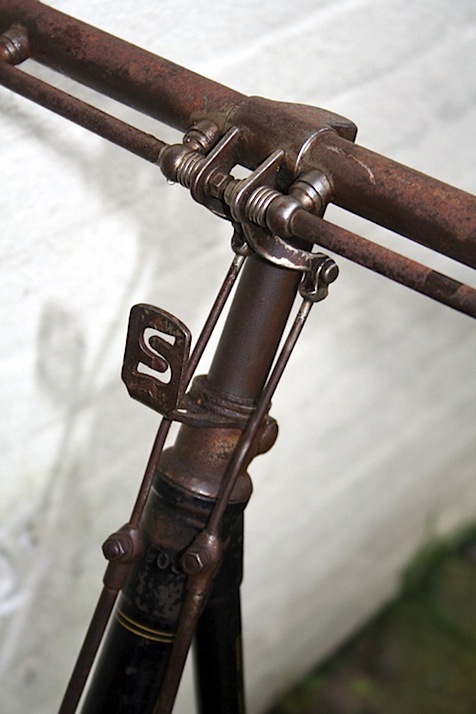 It’s by Blamire Young of Australia.